If for no other reason than the title intrigued you, I am glad that you are visiting my blog. Today’s blog centers around how my broken microwave helped me write. What exactly was wrong with the microwave, you might ask? The Heating Element went out. And since it was the second time that it failed, we decided to replace it and are never going to buy a GE product again. But I digress. . . Since over-the-range microwaves cost a bit more than the college dorm variety, we had to wait a bit to save up for a new one. In the meantime, we had to do things the old fashioned way. We actually had to cook everything instead of nuke it. Not only did this make us very frugal with the amount of food we cooked, because there was no reheating it later. But also it slowed everything down . . .time to get the milk to a screaming baby, no popcorn for DVD night, etc. Yeah, real hardships, I know, but I challenge you guys to go without a microwave to defrost food (among other things) for a while and see if you’re not whining for modernity. As I was coming to the conclusion of my Victorian Romance, I found myself having difficulty drawing everything to a close, partly because I didn’t want to say goodbye to my characters, and partly because I didn’t want to drag on the ending. So that left me with a bit of writer’s block. What should I write to satistfactorily close the novel? A *BLANK SCREEN* blinked at me relentlessly for days. Since I was forced to experience weeks without microwave, I decided to go back to writing, as if I didn’t have modern tools, like a laptop. And I have to say . . .there’s just something about writing out notes and ideas on paper. Drawing circles and lines and arrows for brainstorming. It’s fabulous. I know there’s an Apple equivalent for this called iThought and if I ever get an iPad, you better believe I’m going to buy that app, but still, it’s the ability to draw out your thoughts in a different way than you would just typing on a keyboard. – Brainstorm bubbling – I alluded to it earlier, but to reiterate, use a blank sheet of paper and draw a circle in the center and write a phrase for a scene you’re working on. Then take off in different directions with alternative What-If scenarios like a Choose-Your-Own-Adventure Book (am I dating myself?) and see where your ideas take you. 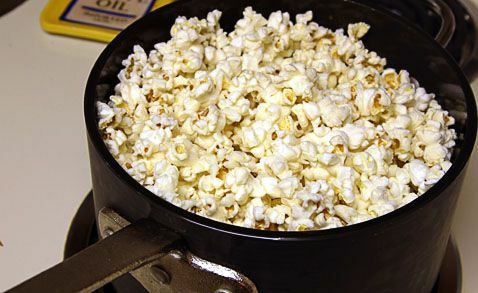 – Stovetop Popcorn – So there’s definitely some finesse required to this . . .just enough kernals with just the right ratio of butter/flavoring, and just the right amount of time, plus constance viligance watching them pop in the pot. This was great for idea brewing. I would imagine my characters are the kernals, and by adding just the right amount of oil and the perfect level of heat and they popped into a tasty treat. If I overheated them, turned my back on them, or didn’t keep them moving, the popcorn would burn. (There’s nothing worse than the smell of burned popcorn – blech) I liken this to how a scene can over-burden a reader with a giant info-dump. The right timing, amount, and (for writing only) placement is key. It really can be done. More than anything a broken microwave reminded me how to get-back-to-basics and reinforced to me that just because something is old (like writing exercises) it doesn’t mean that it’s not helpful or worthwhile to stock your arsenal with. What Phrases Stopped You in Your Tracks…In a Good Way?